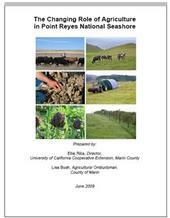 This month, the UC Cooperative Extension office in Marin County released a carefully researched and written report on The Changing Role of Agriculture in Point Reyes National Seashore. PRNS is unusual in the National Park system because it has contained a "pastoral zone" with working cattle ranches, dairies and other farms since its establishment in 1962. The University of California issued a news release about a new Animal Welfare Council on May 19. Jim Downing of the Sacramento Bee picked it up, writing in a story published today that "The University of California, hoping to insert itself as a peacemaker, formed a new animal welfare council last month." In a move that might only occur in a county named for a body of water, the Lake County Board of Supervisors declared a state of emergency last week after Fish and Game officials decided not to stock several local lakes and streams with fish. Fish and Game made the decision after the Pacific Rivers Council and the Center for Biological Diversity filed a lawsuit that blamed the fish stocking program for threatening native fish and amphibians, such as the hardhead minnow, spring- and winter-run chinook salmon, California red-legged frog, arroyo toad and foothill yellow-legged frog. Happy New Year! UC ANR experts are off to a running start in the New Year, with appearances in a number of well-read publications.